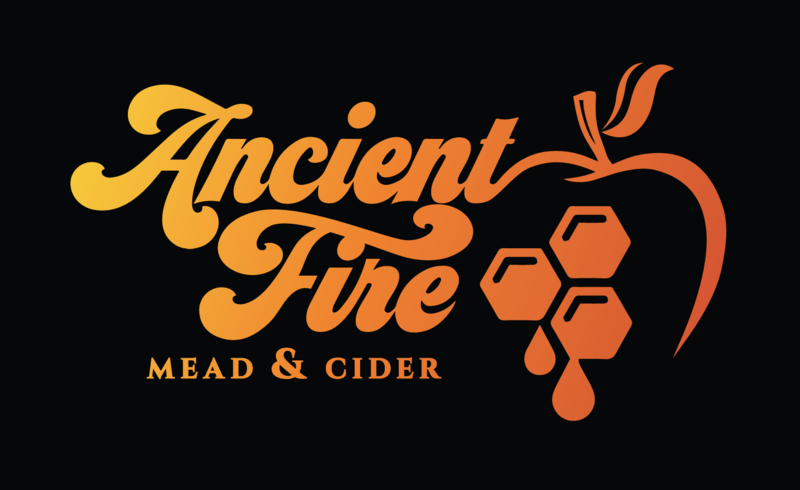 Margot and I have been working on quite a few different things for Ancient Fire in 2017, but one of them has been our visual branding. As we honed in on our logo design our excitement continued to grow. We are so happy to finally be able to debut our new visuals to our entire community! The image at the head of this post is our primary logo, and one you should expect to see on all kinds of Ancient Fire branded materials. We went with a retro font, but a very straightforward representation of apples and honey, our two primary ingredients and basis for our products. Nobody should have trouble figuring out what we do! We have full color as well as black and white versions of this to use in the many different ways we will want to project our brand. Elsewhere on the web site, social media and swag you will see this same image but you will also see other images that we will be using in different ways. To the right is a small format logo that we think will make a great sticker and might also show up on glassware. It is tight and focused, but no less expressive of goals of our brand. Another image you may see will be the one below. This one re-organizes the elements of the core logo above and gives us some flexibility when horizontal space is tight, something that might be really useful for product labels. In the coming weeks, and coincident with our crowd funding campaign, we will continue to debut usages of these designs. We look forward to community feedback as we work to get our brand out there. We’d like to thank our designer Steve Lee for all of his consultation and effort to make this work what it is. Putting an exciting image to our vision is definitely going to be a vital part of our success.